On October 31, Layne Rogerson, McLeod Hospice Volunteer Coordinator and Chaplain, provided information on Advance Directives to Marlboro County residents and stressed the importance of people thinking about the care they would (or would not) want to receive before they find themselves in a medical emergency. 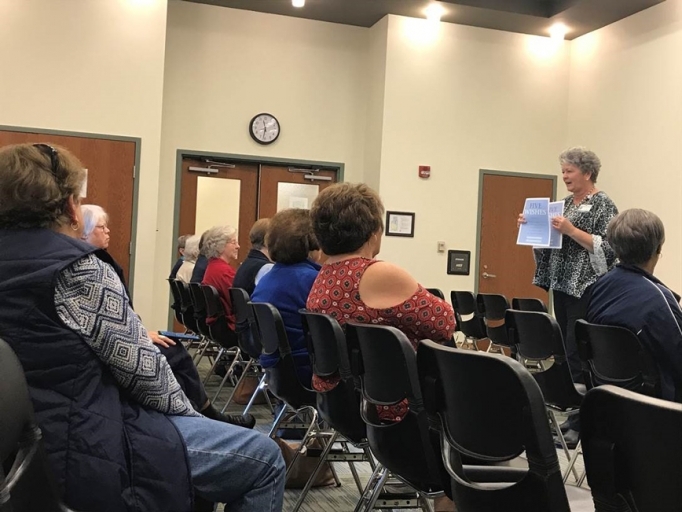 Layne Rogerson, Volunteer Coordinator and Chaplain with McLeod Hospice, hosted a talk on Advance Directives for Marlboro County residents in anticipation of National Hospice and Palliative Care Month in November. More than 20 women attended the event. Representing the McLeod Hospice team for Chesterfield and Marlboro Counties, Rogerson spoke to the group on October 31 at the Marian Wright Edelman Public Library in Bennettsville. She answered questions about hospice, palliative care, and advance care planning – all of which are essential components of high-quality care for individuals coping with serious and life-limiting illness. Hospice care is provided for those with a limited life expectancy and focuses on making patients as free of pain and comfortable as possible while improving their quality of life. Hospice staff members work hand-in-hand with palliative care nurses and physicians who focus on the unique needs of each individual patient. Caring for patients in the region for more than 35 years, McLeod Hospice is dedicated to helping patients live the remainder of their lives as fully as possible. Additionally, the team’s experience includes guiding the patient’s family through this time with their loved one by supporting them physically, emotionally and spiritually. As a not-for-profit Hospice, McLeod ensures that all patients receive Hospice care regardless of their ability to pay. McLeod Hospice serves patients in Chesterfield, Clarendon, Darlington, Dillon, Florence, Horry, Lee, Marion, Marlboro, Sumter and Williamsburg counties. The office that serves Chesterfield and Marlboro Counties is located behind the hospital at 711 Chesterfield Highway in Cheraw, South Carolina. To contact the Cheraw location, please call (843) 320-5510.